1. Keep your blinds closed. 30% of unwanted heat comes from your windows, and utilizing shades, curtains and the like can save you up to 7% on your bills and lower indoor temperatures by up to 20 degrees. 2. Close off unused rooms. This will prevent the cool air from permeating these areas during the hottest part of the day. You'll want to capitalize on the cooler night hours, however, and let air flow naturally through your home. 3. Swap your sheets. Cotton is smarter this time of year as it breathes easier and stays cooler. 4. 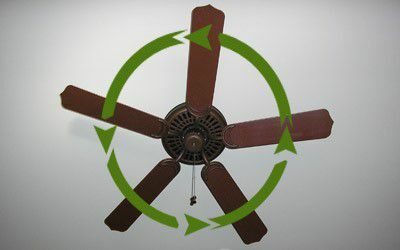 Set your ceiling fans to rotate counter-clockwise. By setting them counter-clockwise in the summer at a higher speed, the airflow produced will create a wind-chill breeze effect that willmake you "feel" cooler. 5. Turn on your bathroom fans, or your exhaust fan in the kitchen. Both of these pull the hot air that rises after you cook or take a steamy shower out of the room. 6. Let the night air in. Make the most of these refreshing hours by cracking the windows before you go to bed. Just be sure to close the windows and blinds before things get too hot in the morning. 7. Ditch the incandescent lights. If you ever needed motivation to make the switch to CFLs, this is it. Incandescent bulbs waste about 90 percent of their energy in the heat they emit, so throwing them to the curb will make a small difference in cooling your home while lowering your electric bill. 8. 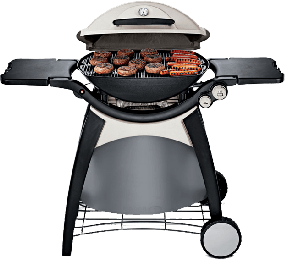 Start grilling. It's obvious, but using your oven or stove in the summer will make your house otter. If it already feels like 100+ degrees in your home, the last thing you want to do is turn on a 400 degree oven.